Despite the rapid proliferation of different indoor positioning technologies, selecting the right technology for a given set of application requirements remains a challenging task. Many of the proposed technologies fail to attain the expected performance levels when migrating from development/experimental environments to realistic target deployment conditions. 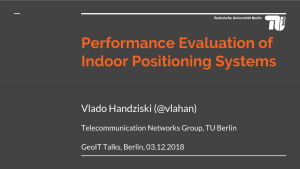 A major contributing factor for these problems is the prevailing praxis of evaluating indoor positioning systems under custom, non-comparable and non-repeatable conditions which significantly diminishes the value of the obtained performance results. The talk will provide a brief overview of some past and ongoing activities to address these challenges through the development of a general methodology for benchmarking of Indoor Positioning Systems. I will present some of our work in this domain as part of the EU EVARILOS project and will report on our involvement in the preparation of the ISO/IEC 18305 standard “Test and evaluation of localization and tracking systems”, as well as in the organization of several large-scale indoor localization competitions by Microsoft and NIST.